This ingot slicing method forms a flat light-absorbing separation layer (KABRA layer*2) at a specified depth by irradiating a continuous, vertical laser from the upper surface of the SiC ingot, producing wafers. Conventional laser processing is not suitable for slicing because the modified layer formed by laser irradiation, in principle, extends in the direction of the laser incident (vertical). However, this process succeeds in forming a KABRA layer, which serves as the base point for separation by separating SiC into silicon (Si) and carbon (C) in an amorphous state and making the amorphous carbon efficiently absorb the light*3. In addition, this process can be applied to various types of SiC ingots, including single-crystal (4H, 6H, and semi-insulation) and multi-crystal ingots. This process can be also applied to monocrystal ingots, regardless of the off-angle of the crystal c-axis. *1: Patent pending (53 related patents as of December 11, 2017) / Trademark registered (Registration no. 5850324). *2: Key Amorphous-Black Repetitive Absorption: Forming a layer which becomes the base point for separating the wafer by decomposing SiC into amorphous silicon and amorphous carbon with continuous laser irradiation, and then making the black amorphous efficiently absorb the light. Repeat processes 1 to 3 and slice the wafer. The existing methods for slicing wafers from a SiC ingot mostly used a diamond wire saw. However, these methods require a number of diamond wire saws for mass-producing wafers because the processing time is long due to the high hardness of SiC. The number of wafers produced from a single ingot is also small due to a large amount of material lost in the slicing sections. This has been a major factor in the increased cost of producing SiC power devices. Existing processes require approx. 3.1 hours to slice a wafer from a Φ6-inch SiC ingot (100 hours for one ingot)*4, 5. In contrast, KABRA can greatly reduce the processing time, requiring only 10 minutes to slice a wafer (approx. 31 hours for one ingot)*6. *4: When producing a specified thickness of 350 µm from Φ6-inch and 20 mm thick SiC ingot. *5: General value based on users' information. *6: When laser irradiation, separation, and ingot grinding are performed in parallel using multiple ingots. For wire processing, a lapping process is required to remove approx. 40 µm*5 of undulations generated on the surface of a processed wafer. However, KABRA does not require lapping because the wafer undulation after separation can be controlled. While wire processing produces approx. 180 μm*5 of material loss per wafer where the ingot is sliced (kerf loss), KABRA has essentially no material loss. In addition, material loss can be suppressed to approx. 80 μm depending on the amount of KABRA layer removal after separation. Thus, approx. 1.4 times as many wafers can produced from a single ingot compared to the existing process. 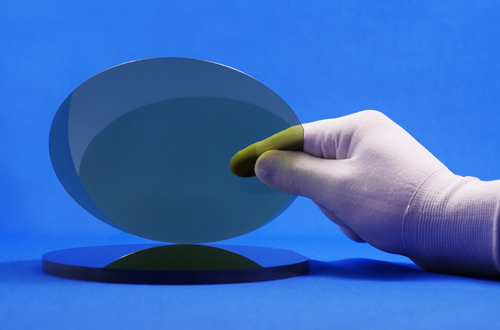 *4: Wafers with a designated thickness of 350 μm are produced from an SiC ingot with a diameter of 6 inches and a thickness of 20 mm. *7: Lapping is performed after cutting using a loose abrasive-type diamond wire saw. All values are standard values based on those acquired from users. *8: When four ingots are processed concurrently. “Kabra” is also another name for a turnip, and thin slicing is sometimes called “kabra-giri”. There is also a vegetable called “kyo-kabra” which is a traditional food with a long history in Japan. We named this process “KABRA” with Roman letters because slicing a SiC ingot looks like “kabra-giri” and we have the strong desire to contribute to enhancing the world’s convenience by spreading this unique laser slicing technique from Japan throughout the world.